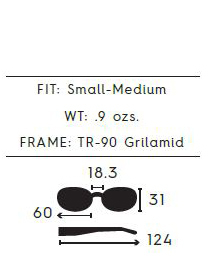 A balance of performance, protecction and sleek design makes these sunglasses a winner. Comfort grip nose pads and temple pads insure a comfortable, stay-put fit. Polarized Lenses Eliminate Glare and Reduce Eye Fatigue. Polarized Triacetate Lenses are Impact and Scratch Resistant, Lightweight and Durable. AcuTint Lens Coloring System Adds Color Contrast Without Distorting Natural Colors, Allowing You To See More Clearly. 100% Protection From Harmful UVA and UVB Rays. Limited One Year Warranty.